It is rainy and grey here, has been all day. So what’s better on a day like this than a dinner of hot soup? And what goes better with hot soup than fresh cornbread? 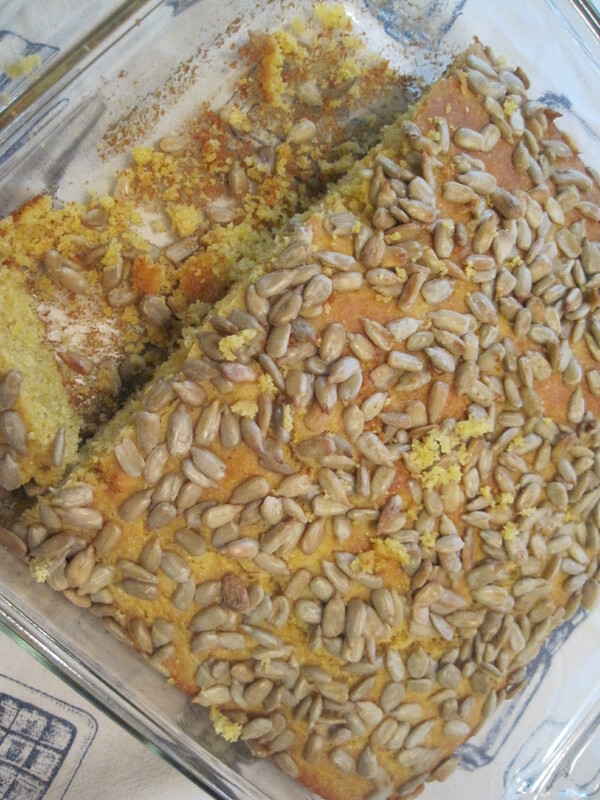 On the menu tonight: lentil, barley, vegetable soup; roasted beet greens; sunflower seed cornbread. Wash and dry your greens. If they are tender (the stalks are smallish) you can use the whole thing. If not, remove the bottom stalks. Toss with enough olive oil to lightly coat them and sprinkle with kosher or sea salt. Roast in 425 oven until crispy. Eat. Yum. Mix all the dry ingredients, except the seeds, together in a bowl. Beat in the wet ingredients until the batter is smooth. Pour into a well oiled 8″x8″ baking dish (glass works best). Sprinkle the seeds on top. Bake at 425 until golden on top. Cool slightly then cut and eat. The seeds add a delicious nutty flavor and lots of crunch (in addition to some extra fiber, vitamin e, and the b vitamins.